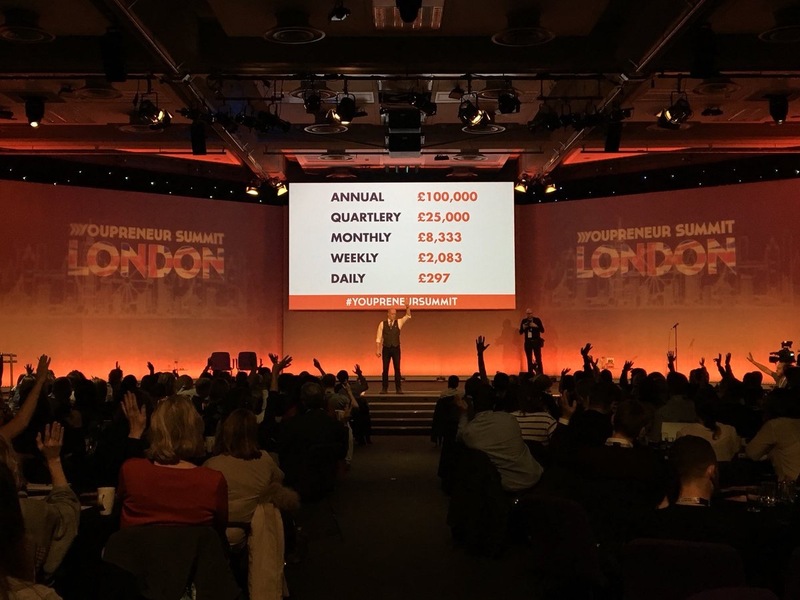 I never need an excuse to travel to someplace new, but this year’s Youpreneur Summit was as good a reason as any to visit the fabulous city of London for the first time. Chris Ducker has a knack for getting great people together. He is particular about the kind of people who would best succeed at his events and in his masterminds, and he’s made it clear in his branding and marketing efforts who would get the most out of them. It didn’t hurt that my good friends, Amy and Vincenzo Landino, would be sponsoring the event as the exclusive live-streaming production team and Jay Baer would be performing the closing keynote! 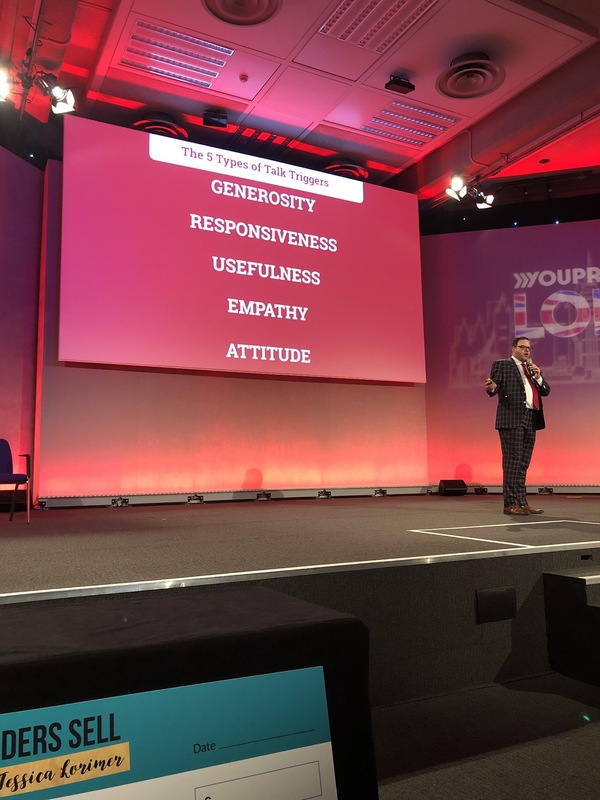 So, off I was to Londontown to learn and connect from fellow entrepreneurs, or, shall I say, YOUpreneurs for two days at the Queen Elizabeth II Centre in central London. What follows are a few of the common challenges and themes I heard at the event, plus my takeaways for what people can do to overcome them. Let me know what I’ve missed in the comments below. Ah, marketing. That elusive, yet necessary tool that all businesses must use to, well, stay in business. Despite the nauseating number of courses, trainings, webinars, and blog posts about the topic, specifically for entrepreneurs and small businesses even, we still can’t seem to crack the code. The strategy that works for one business flops for another and sometimes the best marketing tactics come from not having a strategy at all. As a result, entrepreneurs are confused. They don’t know where to spend the limited budget and resources they have and technological advances can sometimes be a hindrance, not an opportunity. Roger Edwards says that marketing is all about communications that are neither intrusive nor complicated. While many of the speakers at the Youpreneur Summit touched on the marketing philosophies we should employ to keep our audience from running the other way, this year’s summit seemed to focus on video when it came to actual tools and tactics. Because video is such a powerful way to connect with potential customers, it’s understandable. However, I would have liked to see a little more diversity in the types of marketing tactics that were shared so that those who aren’t interested in or comfortable with video would have some alternative options. Next year! Jadah Sellner said it best: If you don’t have your own audience, get down with OPA (other people’s audiences). Your networks are your currency. Don’t be afraid to engage with your communities to share your expertise and ask for their help when you need it. Sometimes you have to give away your knowledge for free before you can start charging for products and services. Prove your worth and earn their trust. Then, sell, sell, sell! Sales and marketing go hand in hand, but I’d argue that selling is an art and those who succeed in marketing won’t always be great salespeople. Selling yourself and your company’s products/services doesn’t have to be smarmy. Jessica Lorimer, a sales coach for coaches, encouraged Summit attendees to find their purpose. I know someone else who encourages this… oh, it’s me! The point is, when you have a purpose in your life, it’s your why for running your business. It helps you be yourself and sell with passion. When people can tell that you care about your work, it’s infectious. They want to care, too. Also, it helps you figure out what kinds of people you want to work with so you can identify and sell directly to them. In her fast and furious 10-minute speech, Kelly Baader spoke of the power of one. It’s all about delivering the number one solution to your number one client. But in order to do that, you must share your passion and your knowledge so that you’re believable to your client and so that your client believes that they can achieve the solution or outcome that you’re offering. People don’t buy whatever you’re trying to sell them, Baader says. They buy a better version of themselves. We’re not all natural salespeople, so it takes some soul-searching and perhaps even some training (Hi, Zig Ziglar!) to get it right. But the investment in becoming a better salesperson will help you take control of your business growth. If you don’t yet have your “why,” now is the time to think about and identify it. No successful business has survived without a mission and a purpose. This will guide you as you frame the message you’ll share in your sales process. Successful sales involves bringing yourself to the process every day. You may have to get vulnerable. And you’ll have to accept that your message or your service isn’t for everyone. But the people you do reach will be YOUR people. And that’s what matters. If you have a team, make sure they’re unified in understanding your sales process so they can personify what it is that you’re selling. You can’t sell one thing and provide something different, which is a common problem of growing businesses. Let your purpose drive the culture of your team and let your team live and breathe that purpose as well. If there’s one thing I’ll always remember from Chris Ducker, it’s this: “Charge What You’re Worth.” This year, he even got t-shirts printed with the saying! But how do you know how much you’re worth? This is the eternal question. Chris encourages us to work backward to find the answer. Start with the goal you have for your annual salary or revenue. Divide that by four to get your quarterly goal. Then, divide that by three to get your monthly goal. Divide that by four to get your weekly goal. And then, if you’re Chris, divide that by four to get your daily goal (he only works four days per week, or so he says!). If you’re a regular businessperson like me, you may want to look more closely at how your business has normally ebbed and flowed. For example, I know Fridays are usually pretty slow days for me, so I might still do a calculation like Chris’s. If you’re someone who works a more traditional schedule, you can divide your weeks by five. Once you’ve figured out your daily goal, you can divide by the number of hours you intend to work each day to determine your hourly rate. Remember: As an entrepreneur, you have a lot of costs to take into account, so don’t only calculate based on the salary you wish to take home. Entrepreneurs have a tendency to set arbitrary goals based on what they think they “should” charge or based on what their peers are charging. Everyone’s situation is unique. Charge what you need based on your commitments, your expenses, and your annual goal calculation and go up from there. There will be folks out there who tell you’re too expensive or that your services are “not worth it.” But there will also be folks who tell you that your pricing is reasonable or even cheap. Keep a catalogue of these comments and adjust accordingly over time. Remember that costs are relative and they’re also personal. You can’t please everyone. Don’t waver on your pricing. If someone can’t afford you, that’s okay. There will be others who can. As soon as you start lowering or negotiating on everything, you’ll devalue yourself and your services. One of the biggest pain points I heard from the successful Youpreneurs in attendance at this year’s Summit was that they were ready to grow, but didn’t know how. Unless you’ve gone to business school or have advisors who can guide you, choosing a growth strategy probably isn’t something that comes naturally. Hell, you probably didn’t even know whether your business would be sustainable past its first month, so you may simply be taking things one day at a time. While marketing and networking and all those other great things are great when you’re starting out, their fruits may become a burden once you’ve outgrown your capacity to provide everything to everyone. This is where the intentional growth strategy comes into play, and, of course, there are many ways to attack it. Most commonly, Youpreneurs are looking to hire virtual assistants or other freelancers to help them manage their workload, but perhaps they don’t know where to find them. Or they’ve got enough great clients but now they want to add a revenue stream. 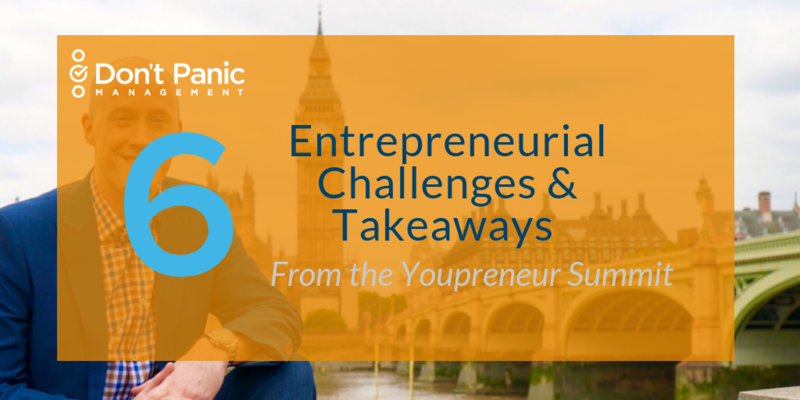 I spoke with many entrepreneurs who were facing this challenge and were grateful to have a good problem, but now were tasked in determining the next big leap in their businesses. If you’ve delegated and automated all you can using tools and processes, consider whether you want to grow a team. Some people do and some people don’t. This is a personal decision. If you do, start planning a budget and writing job descriptions. If you don’t, address your network and see if there are other people to whom you can refer work. If you want to scale your business without taking on more clients, consider product and course creation strategies. This way, you can do the work once and then let the product sell forever and ever without much maintenance. Yes, the beloved passive income strategy really works if you can create something people want for a reasonable price! You can also create a paid membership or community network to create an ongoing new stream of revenue in addition to your products. You’ll need to work on the community, keep members engaged, and provide customer service, but it may be less labor-intensive and less risky than taking on multiple new higher paying clients. This tells me that there may not be a shortage of tools out there, but there is a gap in understanding between what tools we really need and what tools are a distraction. Also, it tells me that entrepreneurs may not be ready to invest in robust and expensive tools, but would rather focus on low-cost or free tools for the time being. For budding entrepreneurs, I believe that the best tools are the ones that can help you automate or organize projects. Buffer for social media automation. Asana for project and task management. Quickbooks Online for invoice and expense tracking. Maybe I’m a bit old-school in my thinking, but I think it’s important to understand the mechanics of everything you do before you delegate it to a tool. Do it manually first. See how it goes. Audit your time. Figure out where you can be more productive by using a tool, don’t simply find a tool to solve a problem you don’t even have. You don’t need anything fancy when you’re starting out, but you do need a good work ethic and a bit of creativity for problem-solving. Once you’ve figured that out, you can add technological tools to level up your operational and marketing chops. Don’t fall for the shiny object syndrome. Using tools because they look and sound cool isn’t reason enough. If you have a true problem in your business, ask your network what they recommend to provide a low-cost solution. Add the shiny tools later, when you have the time and resources to really test them. Don’t let tools strip you of what makes you you. A few of the tools I heard about at the Summit were essentially made to steal others’ marketing copy or create low-budget promotional films that all look the same. Remember that the only way to stand out in a sea of businesses is to do something different. In Jay Baer’s closing keynote, he referenced the astonishing number of companies that gain customers through word of mouth. And yet, none of these companies have a word of mouth strategy. Jay’s new book, Talk Triggers, is all about how to create the thing that makes you talkable. It’s relevant, it’s realistic, it’s repeatable, and it’s remarkable in the most traditional sense of the word. In his closing keynote, he not only shared some hilarious examples of talk triggers gone wrong and right, but he also helped us see that finding your talk trigger doesn’t have to be particularly difficult or expensive. In fact, you might already have a talk trigger in your business and not realize it. While traditional marketing tactics and advertising will work to a certain point, if you’re not getting your customers talking about and sharing their experience with you, you’re going to have a hard time getting new ones. That’s because people trust people they know for recommendations above any blind advertising out there. This seems intuitive, but so many businesses get stuck following the old pay-to-play model of gaining customers. If you truly want to earn attention in a sea of noise, focus on providing a unique, talkable experience for your audience. Examine your business and its processes to determine whether or not you have a potential talk trigger. If you do, capitalize on it! If not, now is the time to find one and put it into action. People trust people and referrals are the most powerful form of marketing. Win your customers’ attention by providing remarkable, relevant, realistic, and repeatable experience that they’ll tell their friends and colleagues about. Same is lame! Do something different. Just try it. If it doesn’t work, try something else. You’ll be able to hone your talk trigger over time, just be patient and be sure to measure your results. This includes asking all new customers how they found you. Overall, the Youpreneur Summit is a fantastic event for entrepreneurs who are looking to get started or even level up their businesses. The caliber of speakers and the smart, kind attendees are worthy of knowing. And the energy that Chris and his entire team brought to the stage (and behind the scenes) was memorable.